Brickcover Total Protection is a waterproofing agent which forms a waterproof barrier to protect bricks against rain water, rising damp, mildew, bacteria, saltpetre, efflorescence and freeze-thaw cycles. 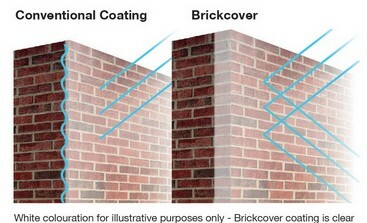 Brickcover’s unique formula allows it to penetrate up to 35mm into the brick (unlike conventional surface coatings) leaving a completely invisible and long lasting finish. Spray, brush or roller applied, Brickcover is a single coat application which cures within 2 hours, forming a long-lasting waterproof barrier. Brickcover is VOC and solvent free, colourless and without odour.